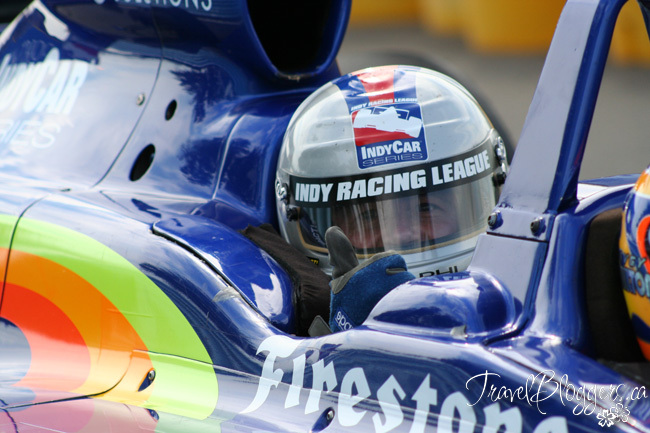 A Two-Seater IndyCar Ride – The Most Fun You Can Have With Your Clothes On! Suited up and ready for the ride of his life! As a race fan going back to when I could barely walk – just being able to say I’ve “been there” is a thrill and an honour. To have been driven around the track in an IndyCar 2-seater is without a doubt a dream-come-true and something I’ll never forget. 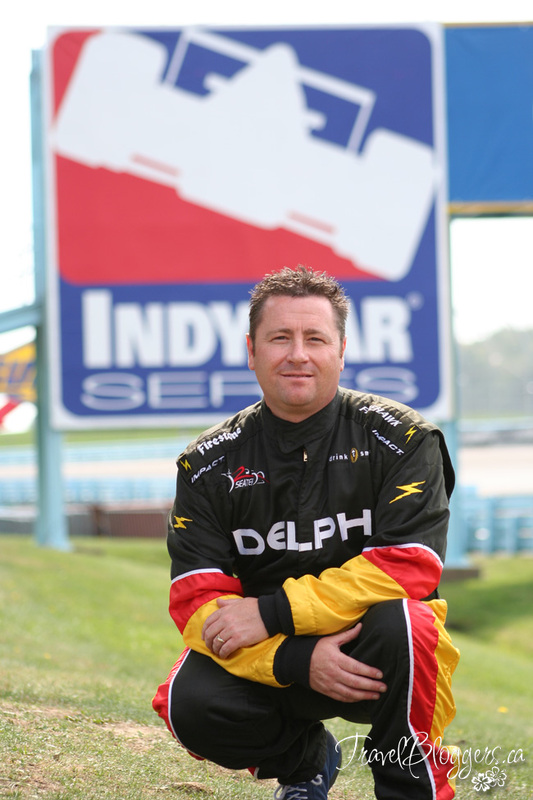 Although this article isn’t ‘brand-new’ it is new to this site and it’s something I thought would be of interest to our readers because the IndyCar Series will be offering 2-seater rides at all 2013 events. 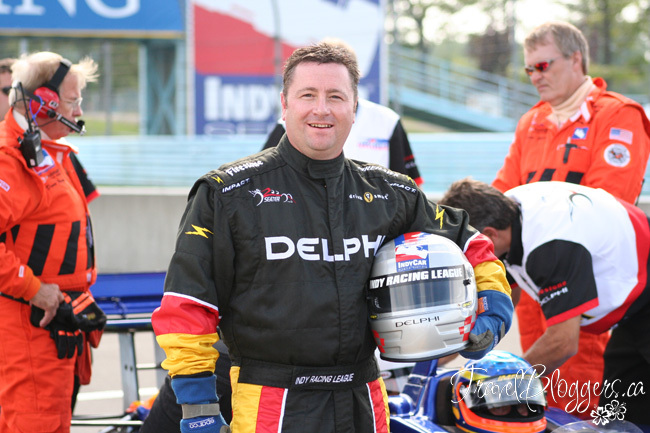 On the Thursday prior to race weekend (Friday-Sunday) a select few of us from the media had the privilege to experience the thrill of two laps of the Glen. I had the honour of doing my laps with Davey Hamilton in the 2-seater IndyCar and it was a very big day for me … because, I got to cross two things off my list of “things I’ve always wanted to do, but never dreamed I’d have the chance” AKA: my Bucket List. 1) Going to a race weekend at the Mecca also know as Watkins Glen; and 2) Getting a ride in the back of a 2-seater IndyCar! The whole experience was so much more than I ever could have imagined, and it gave me a completely new respect for race car drivers. The speeds, braking and cornering were so much more extreme than I thought they’d be … they seemed unnaturally exaggerated … bigger than life! While we couldn’t have asked for a better day at the track – gorgeous, clear, sunny skies with a temperature of approximately 28° C (87°F in old-people temperature), once I suited up (in just the race suit, street clothes and race boots – no other fire proof layers) I was wishing it was just a little cooler and that the clouds would roll in. It was scorching, and I was sweating buckets. The wait for me was about an hour with the suit on – thankfully I didn’t have to be completely zipped up and ready to go during my wait. I really can’t imagine how the drivers handle three layers of fire protection, plus the balaclava and helmet for hours at a time in a tiny cockpit. 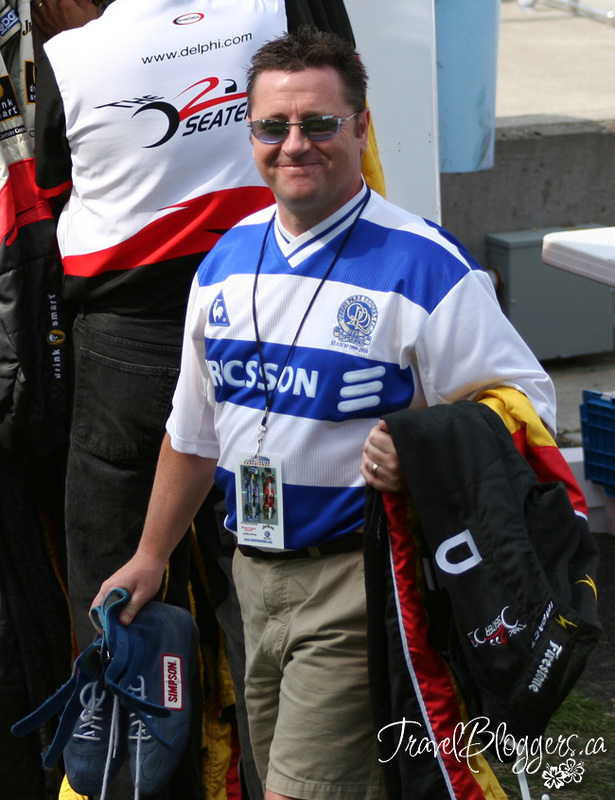 Despite the searing heat beating down on us, the waiting and anticipation was amazing in itself as I watched several other eager participants suit up, hop in the cars and ramble down the pit lane, only to return just three short minutes later (twice around the track). It was incredible to see the huge smiles on their beaming faces – just like little kids at the amusement park. Time To Put The Suit On..
As we waited, stories were relayed and we were told that in all of the rides only one person (a woman) had ever pushed the red “panic” button to stop the ride. I wasn’t worried about being scared … I was worried about accidentally pushing the button and the humiliation that I’d never be able to live down! “Zip Up! !” I was told. Panic came over me suddenly. After all the standing around it was finally time! Balaclava, helmet and gloves all went on quickly. After that I waited for just a couple of minutes more, they whisked me off quickly to the car “Go!! Get In!” they said. I rushed to the car feeling a little overwhelmed, but the crew around me was completely calm and focused. Five point harness … CLICK. Plastic surround fitted around my head … CLICK. The engine fired (and was much quieter than I expected), and Davey gave it some throttle. A couple of blips, put it into gear with a clunk, just bit of hesitation and we pulled off down pit lane. Then BAM!! Off we went like a bat out of hell! The G’s pushed me back in my seat … the rush was amazing and take-off was smooth. Though I couldn’t see straight ahead of us I could see easily from side to side. The sound of the engine was clearly there, but not over-powering (amazing considering I had no earplugs), and the shifts were so smooth that they were almost indiscernible. Turn one came very quickly; it was a sharp right-hander at the same time that the track elevation starts to drop. Downhill, and we were really flying. As Davey braked for “The Bus Stop” I got my first taste of the incredible stopping power these cars are capable of. And as quickly as we slowed down, the throttle was applied and we were flying again, into the long right-hander and into the “Boot” section of the track. I was expecting the first lap to be tame and the second a bit more aggressive, but he was definitely not just cruising around. All too fast, the first lap was over as we screamed over the start/finish line. Iain gives the thumbs up! I was whooping and hollering as we came to turn one and Davey just hammered on the gas, and we went even faster on lap two. It was like he could hear me, because the more I cheered, the faster he went. Then, just as quick as it all began, it was over. We came into the pits, Davey cut the engine and we coasted to the pit box. Three minutes of thrills and exhilaration … never to be forgotten!! “How was it?” I was asked. “The most fun I’ve ever had with my clothes on,” I replied. While I’ve always understood why race-car drivers do what they do, now I REALLY know why they do it! Okay, this may sound a little childish, but I want to be a race car driver now! But seriously, if there are any teams out there looking for someone with no experience, completely out of shape, too old and bringing no financial backing … I’m your man! Anyone? How does it compare to the Formula1 2-Seater ride (F1x2)? Watch this space, because we’ll bring you Gail’s experience around the track in the Minardi 2-Seater very soon! 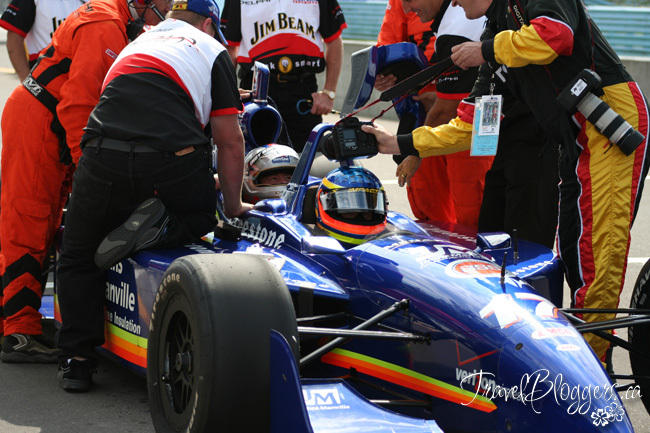 The IndyCar series offers 2-seater rides at all events in 2013. 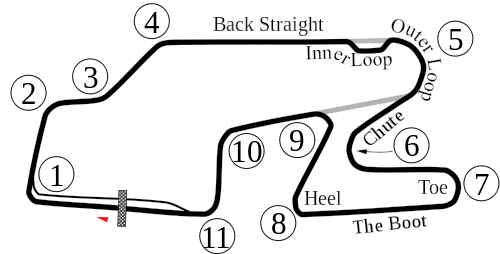 Road and Street courses are usually two laps, while ovals are usually 3 laps. 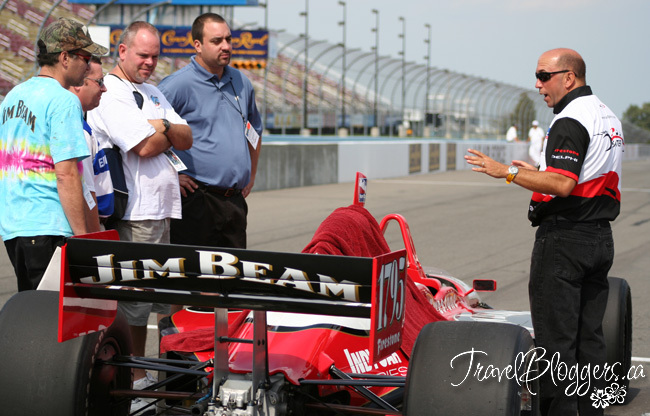 Cost is $499 U.S. At Indianapolis Motor Speedway, you can ride three laps for $499, drive three laps for $1000, or do the Ultimate Indy Racing Experience and drive three laps followed by riding two laps for $1200. The IndyCar Series last raced at the historic Watkins Glen International (nicknamed “The Glen”) in 2009 and remains fan favourite among IndyCar fans to this day. 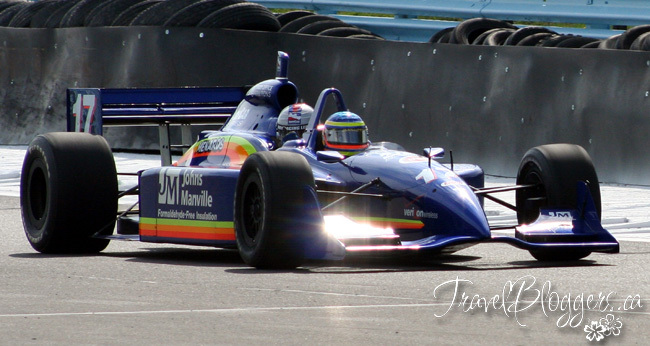 Located near Watkins Glen, New York, at the southern tip of Seneca Lake, the Glen has hosted Formula 1 races, Grand-Am and Trans-Am as well as NASCAR over the years. Map Of “The Glen” – The “BUS STOP” is named Inner Loop For NASCAR fans. Iain Shankland & Gail Shankland started blogging in order to inspire and motive people to travel the world from their perspective – specializing in having the most fun while using the least amount of money, travelling on the cheap without sacrificing comfort.